I attended FINCON earlier this month, and one of the sessions I watched was Kylie Ofiu’s. She advocated that you stop watching TV and focus on making money during that time instead. She made a very good point about how much time is wasted in front of the TV. If you are interested in learning more about making money online check out How I Make Money Online and sign up for your FREE course! In almost any list that involves things you can do to make money from home, I put freelancing first. If you have a laptop, you can sit in front of the TV with it and get to work writing, coding, or working on graphic design. You can even do some virtual assistant tasks while watching TV. Sometimes, when I want to make a little extra money, I work on something in the evening while my husband and I are watching TV. This can be a great way to get ahead on some projects, and make a little money on the side. It can take months or years to build up a web site to the point that it is monetized. However, a lot of the tasks that you can accomplish can be done while you watch TV. From arranging web hosting, to building your site, to writing blog posts, to applying for affiliate programs, you can work on your web site while you sit on your couch, watching TV. Work on your web site for a couple hours a night, and you can start something that offers a reasonable rate of return. If you are interested in setting up a blog for additional income check out How I Make Money Online and subscribe to the free course. These days, almost anyone can invest. While you’re watching TV, consider some of the things you can do to manage your portfolio. You can research investments and, in some cases, even do some trading. You can create a new plan, or evaluate your current plan to see where it needs tweaking. Investing is one of the best ways to build wealth over time, and you can use your TV time to work on creating an income portfolio, or manage the portfolio you already have. Download our free investment ebook on our partner blog Excess Return. I know someone who enjoys crochet. She can crochet while she and her husband watch TV, and then sell the results later. If you are good at crafts, you can work on your hobby while you are watching TV. Crochet, cross-stitch, and knitting are especially good activities for sitting in front of the TV. You can sell your handiwork on Etsy or other craft marketplaces. 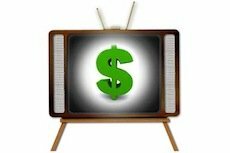 Use TV time to manage your online selling business. You can list items for sale during this time, check your messages and answer questions, and see where you stand. While you still have to leave the house to mail your items in many cases, there is no reason why you can’t manage your auctions and post new items while you are watching TV. There sites that allow you to do simple tasks for others. These are often tasks that don’t take up much time, and that you can do fairly quickly and easily. You won’t become incredibly wealthy by doing small tasks offered on sites like Mechanical Turk and Fiverr, but you can make a few extra bucks while you are sitting in front of the TV, and a few extra bucks is still a few extra bucks. TV time doesn’t have to be idle time. There are ways to make this unproductive and unprofitable time more worth your while. Think about your situation, and your skills. Chances are there is something you can do to make money while sitting in front of the TV. Research anything (recipes to large purchases). To save money. The problem with everything you mentioned is that it actually makes more sense to do all of those activities when you’re not in front of a television. Why not just split your ‘working’ and ‘leisure’ time. That way you can actually enjoy letting your mind relax during a bit of boring tv. There are always great ways to make money, but most of them require you to think about things, so sitting in front of a television while trying to freelance is not a great idea. I have been a freelancer for years and I have to concentrate on my tasks. While I agree with trying to make more money, I don’t agree with trying to use up all of our free time to make more money. We need time to get away and let our mind go free, so if you are paying for TV, why not enjoy it?